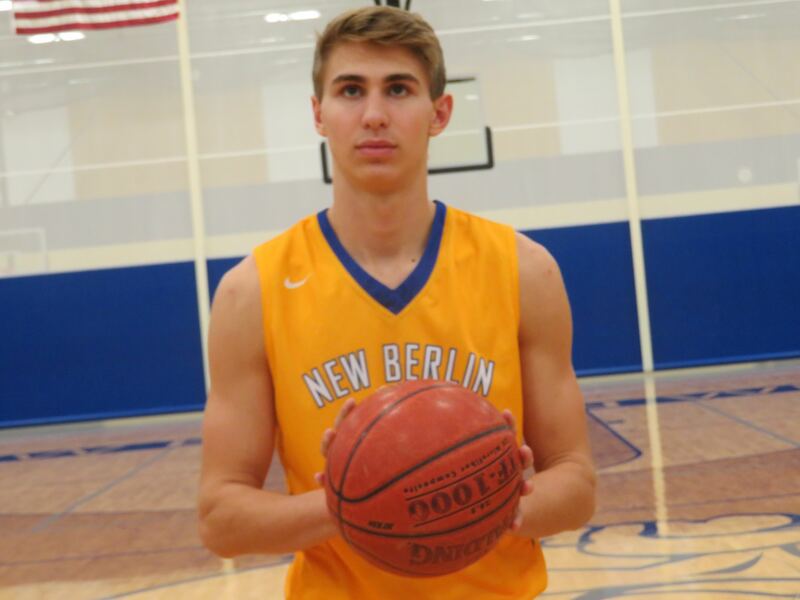 To say that New Berlin West's Tyler Torosian got the 2017-18 basketball season off with a bang would be an understatement. Torosian scored a school record 44 points in a 101-95 win over Milwaukee Golda Meir in the season opener on Friday, Nov 24, in the Fresh Coast Classic at the Klotsche. He broke Charlie Averkamp's record of 42 points. The Vikings trailed 39-33, but rallied to tie the game at 88 and send it into overtime where they outscored Golda Meir, 13-7, to win the game. Torosian hit 13 of 18 shots from the field, 3 of 4 from 3-point range and was 9-of-12 from the free throw line. He also led the team with 10 rebounds. 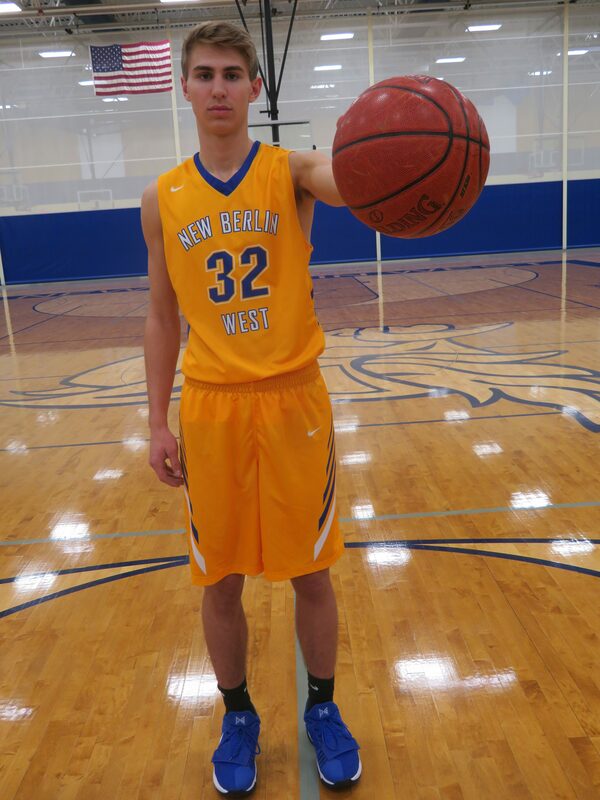 Photo by Tom "Sky" Skibosh --- Senior forward Tyler Torosian set a school record in the opener this season, scoring 44 points as the Vikings defeated Milwaukee Golda Meir in overtime. He also led the tream with 10 rebounds. "I don't think anyone was really expecting it," Tyler said. "I wouldn't say it was out of no where, but it wasn't like we were running a whole lot of plays for me. I started outworking everyone, getting rebounds, hitting a few 3s. I got to the line 12 times. I made my free throws, just put in shots all around. "Everyone knows - even myself - that I'm capable of having a game like that. It's more of a 'We know he can score so we can trust him when he has the ball down low.' It's more of a trust thing." Torosian talked about his role on this year's Vikings team. "I play a forward. I'm not the big guy, but I play the wing," he said. "We cycle it through guys, extend the floor, get up the floor, shoot the 3, drive the hoop. I do just a little bit of everything." Tyler began playing basketball at an early age and knew it was the game for him. "I started in first grade when my dad (Greg) introduced it to me," he recalled. His dad played at New Berlin Eisenhower and at UW-Whitewater. "It was a fun game. He played NBAA for three years and from fourth to eighth grade I played on the school's select team. "I was always a little taller than everyone, so I had somewhat of an advantage. I just like the competitive nature of it. I was never really into football or any other sports." Despite his height - he is currently 6-feet, 5 inches tall, he pointed out a lot of his success comes from the way he plays the game. "A lot of my buckets are from outworking other players," he said. "My rebounds are from out muscling guys, getting up the court. That's just how I've always played. Just trying to get easy buckets." Mattox and Tyler arrived at New Berlin West at almost the same time. "His first year was my first year. I knew his dad," Mattox said. "Tyler hadn't grown into this body yet. But he was coachable and he wants to play well." After playing on the freshman team, Tyler made the varsity as a sophomore, played in 21 games and averaged 5.5 points per game, shot .577 percent from the field and .767 from the free-throw line. He started 6 of 22 games as a junior, averaging 4.9 points and this year he has played well following his huge opener. Photo by Tom "Sky" Skibosh --- Work ethic, hustle best describes the 6-foot, 5 inch Tyler Torosian's success on the basketball court. In 9 games, he leads the team with a 20.7 points average and 14 steals and is second in rebounds (6.8). He continues to shoot well, hitting .595 from the field, .350 from 3-point range and .692 from the free-throw line. He has scored in double figures every game, following the opener (44 points) with totals of 13, 14, 26, 10, 17, 10, 23 and 29. He has also been consistent in rebounding, grabbing 10 7,7, 5, 6, 7, 2, 9 and 8. When the Vikings defeated Greendale, 57-48, on Dec. 8, it was their first win against a Woodland West opponent since Mattox took over and Torosian had 26 points in the game. "He's a gym rat, a serviceable big man," Mattox said. He likes running, he can dunk, pick and roll. What I like about him the most is he has the versatility to guard multi-positions. He is a tough kid with a nose for the basketball. "He has a knack for getting involved. I had no idea he had set a school scoring record in that first game. We did not run one play for him. He has no ego, he just wants to play. He's a team guy, I love coaching him. I told him to be physical, that's OK. He does have to be more consistent at the free-throw line. That part of his game must continue to evolve." Torosian was candid when he talked about his strengths and weaknesses. ​"I'm good at finishing around the basket and I'm a decent rebounder for not being big and wide (he weights only 180). I'm pretty good at that. I also enjoy running the court in transition. "But I need to work on my all around defense. I feel that's not the strongest part of my game. I'm working on quickness, keeping guys in front of me, trying to guard smaller defenders." One thing Mattox doesn't have to worry about is Torosian slacking off. "I love the game so much, I try to get better at it everyday," Tyler said. I like shooting around after practice, just going hard all the time. I try to out work everyone else, getting better, working in the off-season, lifting weights, putting shots up. I'm working on basketball all the time." For a big man, Tyler loves the transition game. "I enjoy running the court instead of being in a half-court setup," he said. "When I'm up the court, passing everyone else, even when they have a guard back, it's hard for the guard to stop someone who is 6-5, if they're smaller - even 6-1 - it's hard to stop me." Both Tyler and Joe Robey are team captains and Tyler is happy to take on the responsibilities. "Being a captain you need to bring leadership," he said. "With me and Joe - we're two of the four seniors - we have to make sure to hold guys accountable for what's going on. For stepping up when the team needs us, being an overall leader. "It's important to me being a captain. I've always been a quieter guy. This year has been a little bit of a change, taking charge, leading the rest of the guys. We're a younger team. We have like five juniors, five sophomores. "I wouldn't say I'm the most vocal guy, but I think I lead by example in practice, running drill to drill, not walking around, making guys follow by example." But earlier this year, Mattox saw a different side of Tyler when New Berlin West was trailing West Allis Central by one point at half time. "We were losing and I felt we played a really bad half," Tyler said. "We should have been up. We really weren't rebounding well at all. They were just out hustling us. I just wanted to get guys pumped up to go out there and just win it." West went on to beat the Bulldogs, 68-63, outscoring them, 41-35, in the second half. Mattox laughed when I asked what kind of kid was Tyler off the court. "He's kind of a goof ball," he said. "He has this big Russian fur hat he wears. He's playful, but real laid back. He's a different kid. I love coaching him. He's very social. I think he has a bright future." Torosian has been happy with the direction of the program under Mattox. "I think the program as made tremendous steps since I was a freshman," he said. "We only on two games when I was a freshman and now last year we had our first season with double digit wins in four or five seasons. MOST MEMORABLE MOMENT: ​Scoring a school record 44 points in this year's opener.